إن فندق Quality Hotel Dickson بموقعه الممتاز في هذه المنطقة السياحية هو نقطة انطلاق جيدة لنزهاتك في هذه المدينة المذهلة. إن موقع الفندق الاستراتيجي، الذي يبعد 4.2 km فقط عن مركز المدينة، يسمح للنزلاء بالوصول سريعاً وبسهولة إلى العديد من الوجهات المحلية المثيرة. يقع هذا الفندق الحديث على مسافة قريبة من المعالم السياحية الشهيرة. يقدم Quality Hotel Dickson خدمات لا غبار عليها وكل أشكال اللياقة وحسن الضيافة اللازمة لإسعاد ضيوفه. هذه بعض الخدمات الموجودة في هذا الفندق: واي فاي مجاني في جميع الغرف, مكتب الاستقبال على مدار الساعة, مرافق مخصصة لذوي الاحتياجات الخاصة, تخزين الأمتعة, واي فاي في المناطق العامة. تنعكس أجواء Quality Hotel Dickson في غرف الضيوف.تلفزيون بشاشة مسطحة, اتصال لاسلكي بشبكة الإنترنت (مجاني), حوض الاسترخاء, غرف لغير المدخنين, مكيف هواء هي بعض الميزات الموجود في العديد من الغرف. يقدم الفندق مجموعة واسعة من وسائل الراحة المتنوعة، كمثل: مركز للياقة البدنية. إن Quality Hotel Dickson هو مكان مثالي للمسافرين الذين يتطلعون إلى الراحة والاستجمام في المدينة. Very good location with Transport readily available to City, Town Centers & all Attractions - if you don't want to navigate your own way through Canberra's sometimes confusing carriageways! Attached to a well run Club. Surrounded by an eclectic bunch of Eateries. Situated opposite a relatively small but thriving shopping Centre. Highly recommended. This was a one night stay as a break in a long drive from Melbourne to Sydney, we arrived in Canberra at 6pm, it was down to 5.c and we walked into a Hotel room that was already heated, that night it got down to minus 7, the Hotel is part of the Dickson Tradies Club, so you get free membership and can use the club facilities as well as have very good inexpensive dining. The room was very large with 2 queen sized beds and had microwave, crockery, etc. I was very impressed with this hotel. Great value for money. Rooms were large, bathrooms large and clean, heater worked well on very cold nights, and bed was comfortable. Close to restaurants and Woolworths. I would definitely stay here again. A large spacious room but a bit dark. Bathroom had no fan or windows. Plenty of parking and good places to eat in walking distance. A good location and only a short walk from all the nightlife in Dickson. 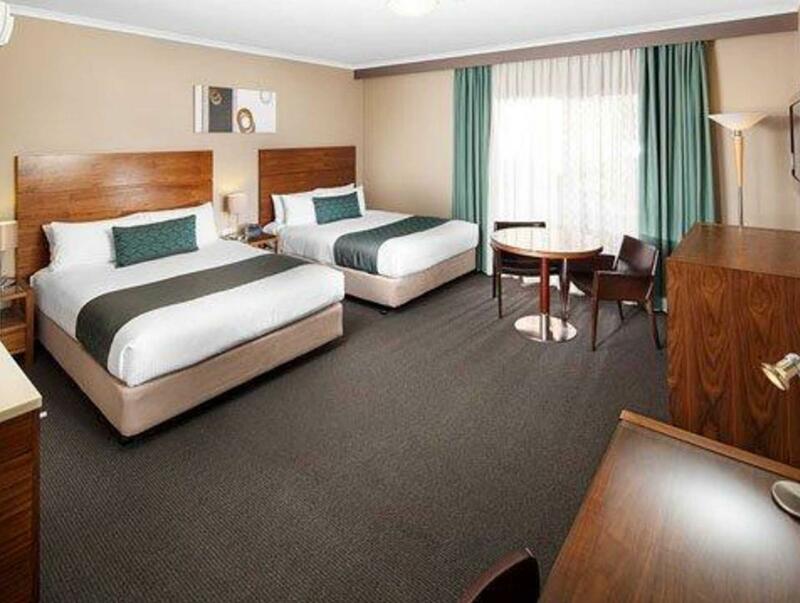 This hotel is part of Tradies club and club facilities can be accessed easily from your room. The rooms are basic but clean and reasonably spacious. No cable TV or mini bar but room service is available but only until 9pm although the club itself is open to the wee hours. It does what it says on the box, but like a lot of Australian hotels it is expensive for what is essentially a "motel". Still, friendly and efficient staff, large rooms, nearby "Tradies" club with "pokies", a bar and ordinary but reasonably priced restaurant. Good restaurants, cafes, supermarket nearby, convenient to access the rest of Canberra by car. Nor bad. We stayed in room 124. The line to hang the towels up is broken. There's no shower curtain to help keep the floor clear of water. We had to use clean towels to mop up the floor after every shower and no way to dry to them. Bluey's café got the breakfast menu orders wrong daily! It was a joke. I wouldn't recommend anyone buying the breakfast option. Room was well equipped with mic and coffee maker, but TV screen too small and no TV quiet. It was also quiet, good parking. The local Asian and Greek restaurants are terrific! Bathroom hand basin didn't have a plug and when we rang reception to get one they advised as they were the only one on duty we would have to wait until the morning. This is the second time we have stayed at this motel and experienced this problem - do guests pinch the plugs? We were visiting my son and his wife who live on Cowper road. We usually stay there but were unable to on this occasion. Your hotel was excellent in all respects- clean, quiet and spacious- a lovely place to return to each evening. We did not eat in your dining area so we have not evaluated it but we appreciated the toaster and microwave for breakfast and cuppas. We were recommended your hotel and would recommend it to others. Our stay this time preceded a previous stay here, and was enjoyed by us for the hot shower and comfortable beds and ironing facilities. It's a good place to visit our favourite restaurants and shopping malls and markets. We will be visiting again for sure. great value for money , breakfast was included which was excellent, room with 2 queen size beds was great as we had a bed each as friends traveling together restful night sleep. Will stay again if I can get a good deal like this stay . location to shops, adjoining the club and choice of dining, 5 minutes to city centre. We enjoyed our stay at Quality Hotel Dickson, everything you need is only minutes away. The room was very clean and was great for a family of 4 having 2 queen beds. Internal access to the Tradies club for a meal or a few drinks. Will definately stay here again when I visit Canberra. Staff were fantastic, everything central in one place.....pub, cafe, sports bar, pokies, social area all under 1 roof!! Supermarket, maccas, petrol station and all types of eatieries and pubs across the road or within very short walk Room was great meals at Tradies were excellent and well priced and breakkie at Blueys cafe was AMAZING!! Highly recommend and when we are next back in canberra will definately be booking in again! 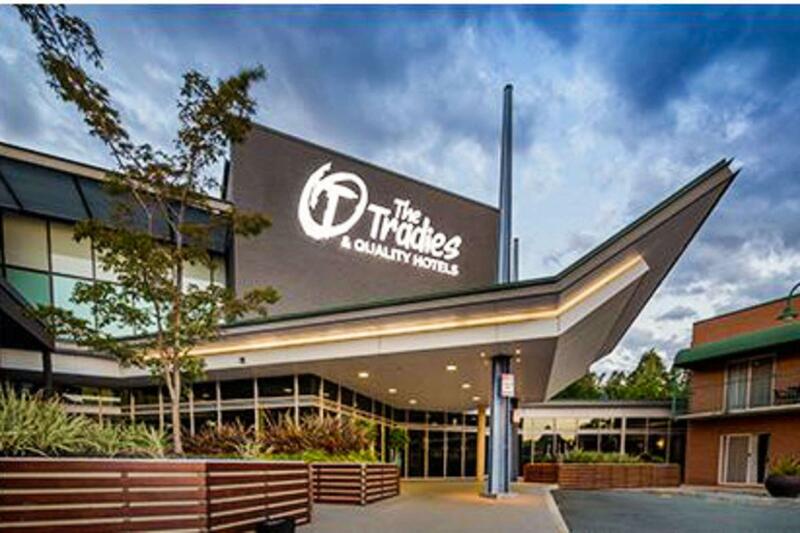 Could not fault it, comfortable clean room, excellent and helpful staff and free one year membership to Tradies Club which has excellent facilities including a happy hour and two excellent dining facilities. We stayed here overnight and it was very nice. The room was comfortable, we had our own private balcony and there was a spa. The only downside was that the shower was over the spa which made it hard to get in and out of. Overall, we would stay here again, it's close to the local shops and a short drive away from the city centre itself. The hotel is very quiet, the rooms excellent and the staff very helpful. It is right next to Dickson shops and restaurants which makes dining very convenient. This Hotel is in our opinion the best value in Canberra, right next to Dickson shops and restaurants, with the bike route at the rear boundary. The parking and security is excellent, and the staff helpful. It is, despite its central location, very quiet at night, and the rooms are spacious and clean. The only slightly confusing thing was that we were offered a breakfast deal for one of us, when there were 2 people. We think it would be better to offer a breakfast option at a set price PER PERSON. All in all, a very good option for the inner north....close to War Memorial, the City and ANU. We are an older couple with grandchildren living in Canberra. It is an ideal place for us to stay, easy to find, meals on site, the grandchildren can meet us there for a meal which is particularly convenient for us especially during the winter months.